An antenna is a device which enhances the coupling between a local electric oscillator and the propagating waves of the electromagnetic waves. Antennas are widely used for the emission and reception of radio waves, but their visible counterparts have only been considered recently as their dimensions must be controlled with wavelength-scale precision. Positioning the light emitter with respect to the antenna is an especially delicate aspect of coupling. We have fabricated patch nano-antenna where the emitter is located 15 nm above a metallic plane and 15 nm below a metallic disk of 1 to 2 µm (fig. 1a). For a nanocrystals agregate in a patch antenna, placed deterministically at the center of the disk, acceleration factors up to 80 have been measured (fig. 1b-d). 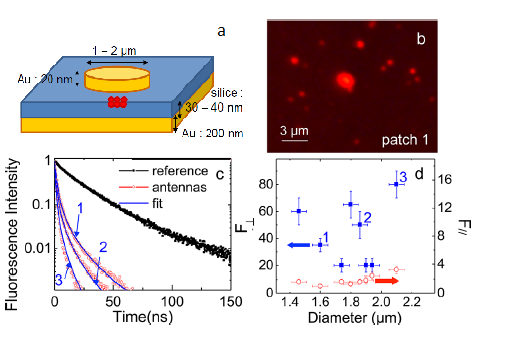 We have developped lithography protocols for the deterministic positioning of a single nanocrystal at the center of a patch antenna and shown a strong luminescence enhancement and an important contribution from multi-excitons. Figure 1 : (a) Schematic of the patch antenna ; (b) observation by fluorescence microscopy (collab. IOGS) : the emitter at the center is coupled to an antenna and appears much brighter than the neighbouring non-coupled emitters ; (c) decay curves of three different antennas with different diameters (red) and an emitter in a reference medium (homog. silica) ; (d) acceleration factors extracted for a vertical dipole (blue) and a horizontal dipole (red).